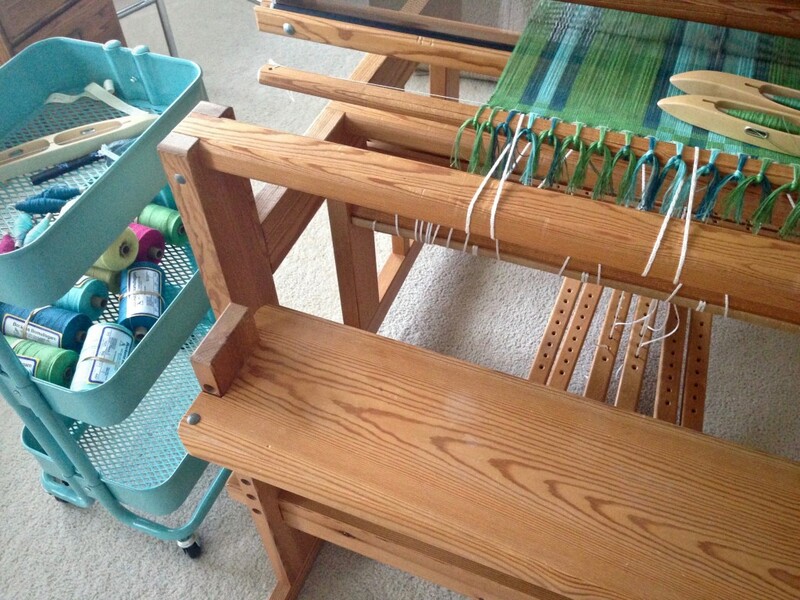 Having a cart beside my loom is the next best thing to a loom-side assistant! A turquoise utility cart from IKEA sits beside my Glimåkra Ideal. An Elfa drawer system on casters is right beside the Glimåkra Standard, and keeps oft-used tools within arm’s reach. 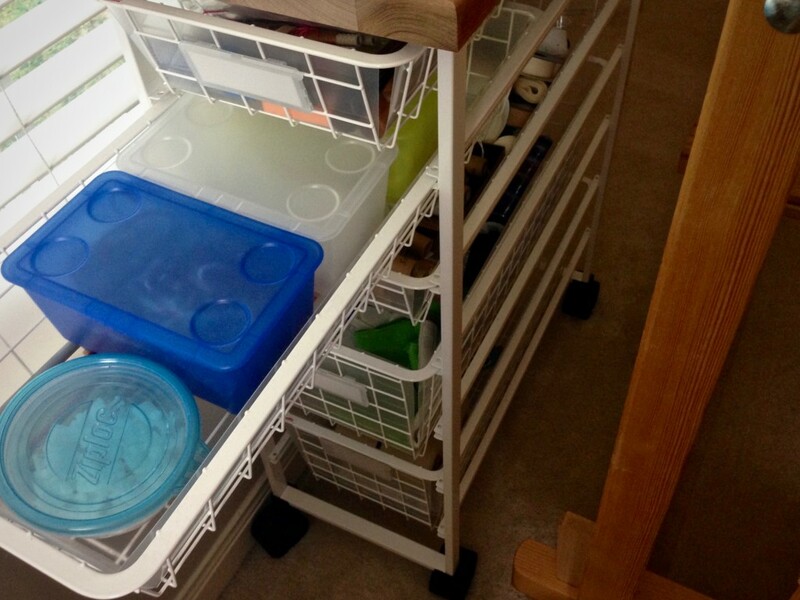 The IKEA cart (Råskog Utility Cart) serves as a holding space for any project on the Ideal. 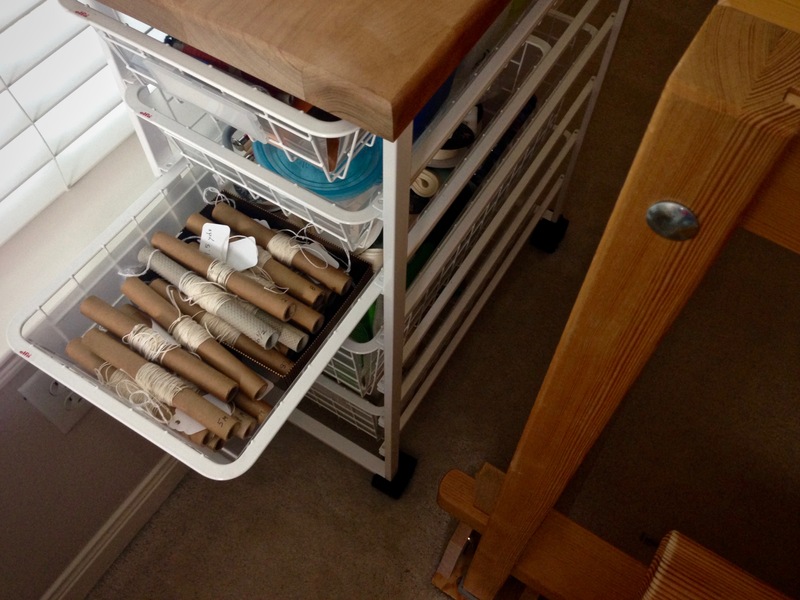 Since this loom is not in the room where I keep my weaving supplies, it helps to have a rolling cart that holds items as needed. The three tiers hold tools and supplies for dressing the loom, like sley hook, extra Texsolv heddles, and treadle cords. While weaving, I keep extra shuttles and small tools on the top tier. All the weft thread or yarn for the project goes on the second or third tier. When I weave rag rugs, fabric strips that are sorted by design and/or color are piled up on the three tiers. IKEA utility cart holds thread and wound quills while I try out weft colors on a new warp. The Elfa cart enhances efficiency at the big loom. 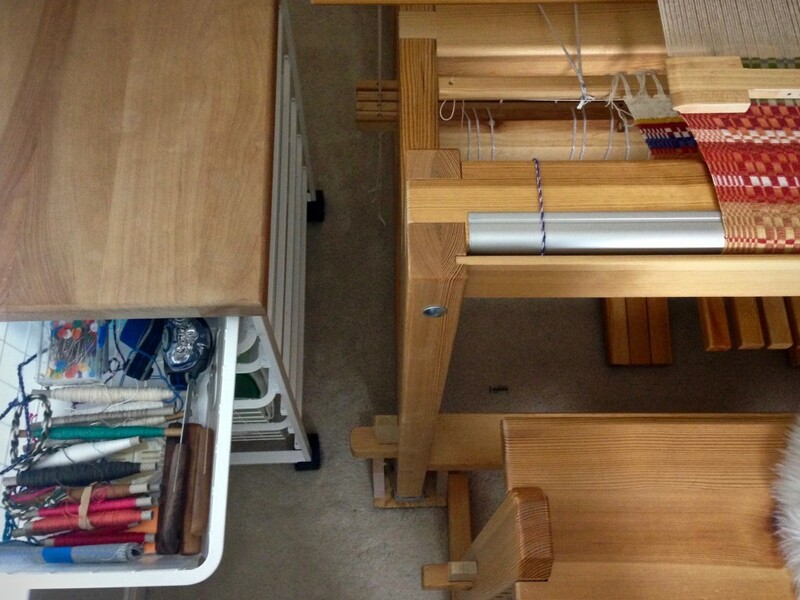 It houses frequently-used essentials, especially small tools and supplies needed to dress the loom. It is near my work table where I wind quills, so yarn for the current project goes in the deep bottom drawer. The woodblock top adds a nice touch that compliments the wood of my Swedish loom. Too many leftover quills from projects sit in the top drawer of the loom cart. Sley hooks, flat head pins, headlamp, pencils, tape, and other small tools and gadgets are in this top drawer. Second drawer has anchor pins and arrow pegs for Texsolv cord, box of choke ties, box of long treadle cords, box of short treadle cords. I found the little boxes at IKEA. Guide strings for measuring warp are wrapped on empty thread tubes. This drawer also holds rolls of twill ribbon used for measuring weaving length at the loom. Yarn in the bottom drawer is only a half step away from the winding station. All the cotton and wool weft for the current project is in this drawer, making it easy to grab what I need for winding more quills. May your loom-side assistant serve you well. Karen, you, my friend, are very organized…something I strive for. I especially like your method for keeping your guide strings orderly. I have a bag of empty tubes, so you’ll find me sorting my guide strings this week! Hah! Any plans for a Vavstuga trip this year? Vavstuga this year? I haven’t ruled it out; I’m always looking at the list of classes and dreaming about what to do next. The hard part is fitting it in. Loving both carts, and how organized they are! That monks belt on your loom is terrific! Hi Laurie, I like to try to be organized, even though I don’t “feel” like an organized person most of the time. 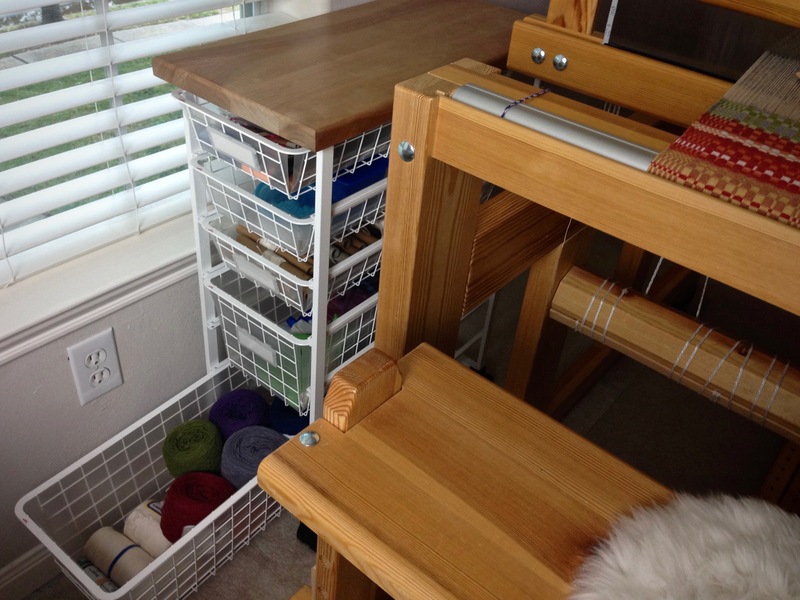 I have a couple of those tall 6 drawer plastic rolling carts next to my looms but I’ve often admired that IKEA cart while at the store but never came home with it because of lack of space…….I never thought of next to the loom, it will be great for the loom at the beach cottage! Cindie, I admired the IKEA cart at the store, too. I had to come home and figure out how I *needed* to have one. It didn’t take me long. Now I don’t know what I would do without it beside my loom! It’s not only attractive, it’s functional! Yay!! WOOH. I’m really not organized. No guide strings here, just a trusty tape measure used for all projects. A castle at the top of my Macomber has a tray for the tools, an open bin on my rocking bench holds shuttles, and a basket on a table next to the loom holds the quills. Real simple here.no fuss no muss. Looms in two states always ready to go, I do have two secrets: scissors are tied to the loom and I have a hand woven pin cushion attached to the castle always in reach with pins and needles. My weaving work space is shared with sewing machines, knitting needles and yarn, quilting supplies laundry and my husbands desk. Sounds like a wonderful space! I need to make some handwoven pincushions to put on the looms. Good idea.